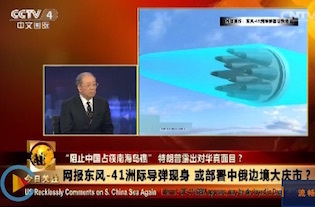 The main Communist Party newspaper reported in December that the DF-41 is one of Beijing's most potent new weapons. The People's Daily said the DF-41 would be fielded early in 2018 and has a range of over 7,500 miles. As in the past, the latest DF-41 flight test appeared timed to send a political message to the United States. The most recent test took place days before a U.S. trade delegation headed by Commerce Secretary Wilbur Ross visited China for talks. China issued a statement Sunday warning that if the Trump administration goes ahead with plans to impose $50 billion in tariffs on Chinese goods that Beijing would break off past trade accords. "If the United States introduces trade sanctions including tariffs, all the economic and trade achievements negotiated by the two parties will be void," the official Xinhua news agency said. Before last week, the most recent DF-41 flight test took place Nov. 6—two days before President Trump visited Beijing in what military analysts said was an intentional show of force prior to the presidential visit. 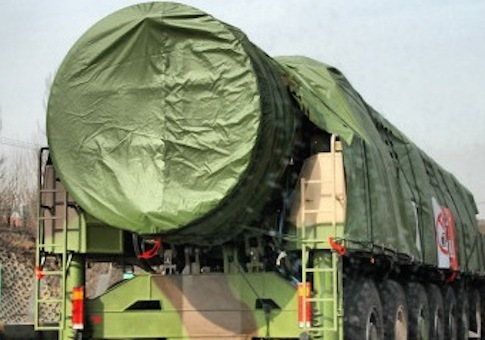 A report made public last year by the National Air and Space Intelligence Center said the DF-41 is a new road-mobile ICBM likely capable of carrying MIRV payloads. "The number of warheads on Chinese ICBMs capable of threatening the United States is expected to grow to well over 100 in the next five years," the report said, noting China's Strategic Rocket Force "continues to have the most active and diverse ballistic missile development program in the world." "It is developing and testing offensive missiles, forming additional missile units, qualitatively upgrading missile systems, and developing methods to counter ballistic missile defenses," the report said. Rick Fisher, a senior fellow at the International Assessment and Strategy Center, said the 10th flight test is a significant milestone. The test "means this mobile, solid-fuel intercontinental ballistic missile is much closer to deployment, in both its road-mobile and rail-mobile versions," Fisher said. "As the missile already has been tested with up to 10 new small warheads, it can be expected that the DF-41 may also become an early carrier of China's developing nuclear and non-nuclear maneuverable hypersonic glide vehicle warheads," Fisher added. Hypersonic glide vehicle warheads, when deployed in the next several years will provide China with a capability the United States has sought to develop through its non-nuclear rapid strike system known as Prompt Global Strike concept, he said. Additionally, the DF-41 is expected to accelerate China's development of a next-generation JL-3 submarine-launched ballistic missile for the new Type 096 nuclear-powered ballistic missile submarine that is expected to come on line in the early 2020s. "China's rapidly modernizing intercontinental nuclear and non-nuclear strike capabilities undermines the credibility of America's extended nuclear deterrent upon which so many U.S. allies have come to depend," Fisher said. "Washington must rapidly redeploy theater tactical nuclear weapons or some U.S. allies could opt for their own nuclear deterrent in the face of China's growing missile threats." Air Force Gen. John Hyten, commander of the Strategic Command, told a congressional hearing in March that the Chinese and Russian nuclear buildups are behind plans for the Untied States to build a new sea-launched nuclear cruise missile. "The threat is from both Russia and China that drives the need for the sea-launched cruise missile," Hyten said. A senior Strategic Command official told the Free Beacon earlier this year that plans for new low-yield nuclear warheads were prompted by China's large-scale deployment of medium- and intermediate-range nuclear missiles, and Russia's treaty-violating ground-launched medium-range nuclear cruise missile. To deal with the China threat, Strategic Command recommended deploying a new sea-launched missile, to be fired from either a surface warship or submarine. The new smaller warheads, that can be developed from the existing primary nuclear warheads currently in the arsenal, were recommended in the Pentagon's recent Nuclear Posture Review completed in February. The review warned that China is engaged in a large-scale buildup that includes future deployment of the DF-41 that the Pentagon calls the CSS-X-20. "China continues to increase the number, capabilities, and protection of its nuclear forces," the report said, noting excessive secrecy surrounding the build up. The Pentagon report mentioned the DF-41 as one of the major worries. "China has developed a new road-mobile strategic intercontinental ballistic missile (ICBM), a new multi-warhead version of its DF-5 silo-based ICBM, and its most advanced ballistic missile submarine armed with new submarine-launched ballistic missiles (SLBM). It has also announced development of a new nuclear-capable strategic bomber, giving China a nuclear triad. China has also deployed a nuclear-capable precision guided DF-26 intermediate-range ballistic missile capable of attacking land and naval targets. A Chinese Embassy spokesman did not return an email seeking comment on the missile test. 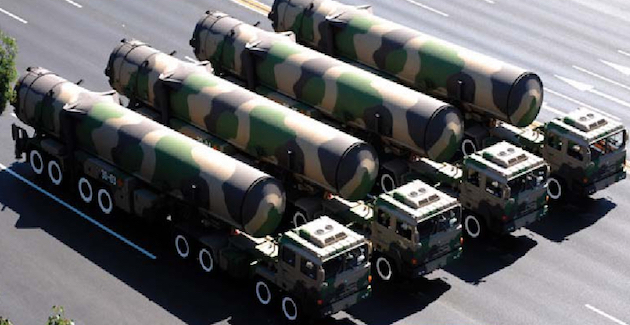 China's Defense Ministry has said in the past in response to an earlier DF-41 test that it was common for missile tests to be carried out for scientific research. "Such tests are not aimed at any specific country and target," the ministry said in response to an April 2017 DF-41 test.